Written by Cody Landefeld on July 19, 2018 Blog. WooCommerce and WordPress are both free, open source software. While this can represent considerable savings, when it comes to WooCommerce pricing, there are still some costs involved in launching a new store. 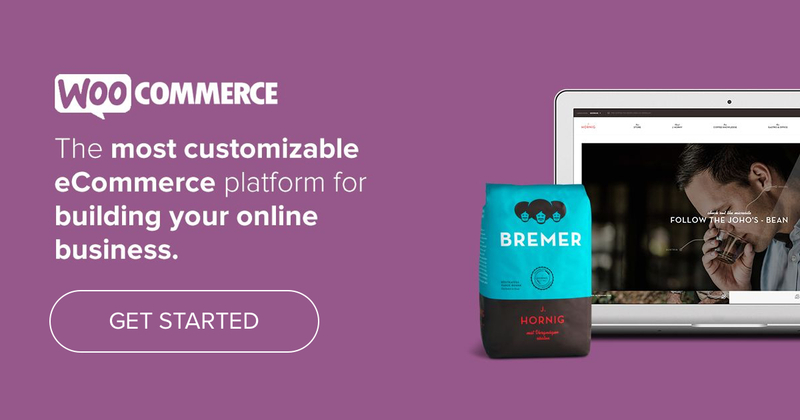 One of the reasons many people choose WooCommerce is because, like the software itself, costs are customizable — you have a lot more control over what you spend and when than with most other eCommerce platforms. WooCommerce is a plugin, so you’ll need a WordPress site that can use plugins. The very first thing you’ll need to do is choose is a host for your store and buy a plan. This is actually quite easy. 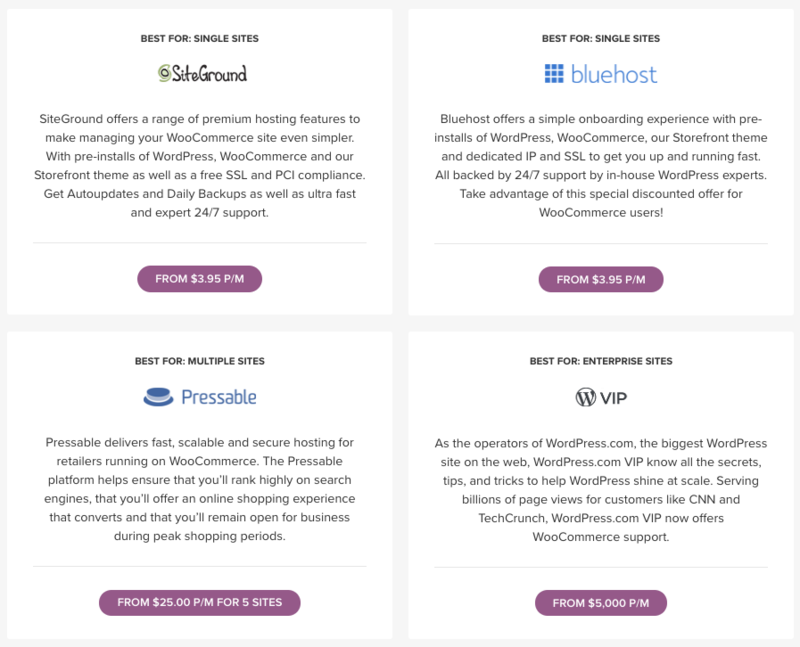 WooCommerce and WordPress both recommend hosts like SiteGround, BlueHost, and Pressable. These hosts are great to start with, although if you’re migrating an eCommerce store, or will be running a large site, work with a host with specific WooCommerce expertise. WordPress.com also offers a Business plan, which allows sites to upload plugins. Read more about WooCommerce hosting options and the performance measures you should expect. With WooCommerce, you have a lot more control over what you spend, and when you invest it, than most other eCommerce platforms. Hosting can be as little as $3.95 per month and as high as $5,000. Most hosts offer an initial free or low-cost period, and offer discounts when you buy hosting services for two or more years. The next cost is registering a domain, or site name. Like hosting, domain registration often comes at an inexpensive introductory price that rises over time, with discounts when you buy multiple years of service. Expect to pay about $15 per year for each domain name you use. Many hosts offer domain registry searching for free when you are in the process of choosing a hosting plan, so you can find out early on if the name you like is available, has been taken, or is for sale. eCommerce and WooCommerce themes: To pay or not to pay? Now we’re getting into optional costs. The first one you’ll face will be your eCommerce website theme. If you’ve used WordPress in the past, you know there are thousands of free themes out there, many of which have been optimized for WooCommerce. Many new eCommerce businesses start out with WooCommerce’s official Storefront theme. It’s a well-developed, simple theme and if you run into trouble, there’s lots of help available from WooCommerce or at local WordPress meetings and WordCamps. Storefront is an intuitive and flexible, free WordPress theme offering deep integration with WooCommerce. If you’re leaning toward a free theme, be sure to choose one created by a developer with WooCommerce experience, and look for one that is well-maintained (e.g. has been updated recently and is compatible with the latest version of WooCommerce). Free themes tend to look similar, so your site won’t stand out as much. Free themes have limited functions. Paid themes provide customer service; at best, free ones post a Q&A board. Paid themes are regularly updated and will notify customers about updates. Paid WordPress and WooCommerce themes cost anywhere from $20 to $100 per year. WooCommerce itself offers a lot of free tools — many borrowed from WordPress and adapted for WooCommerce. 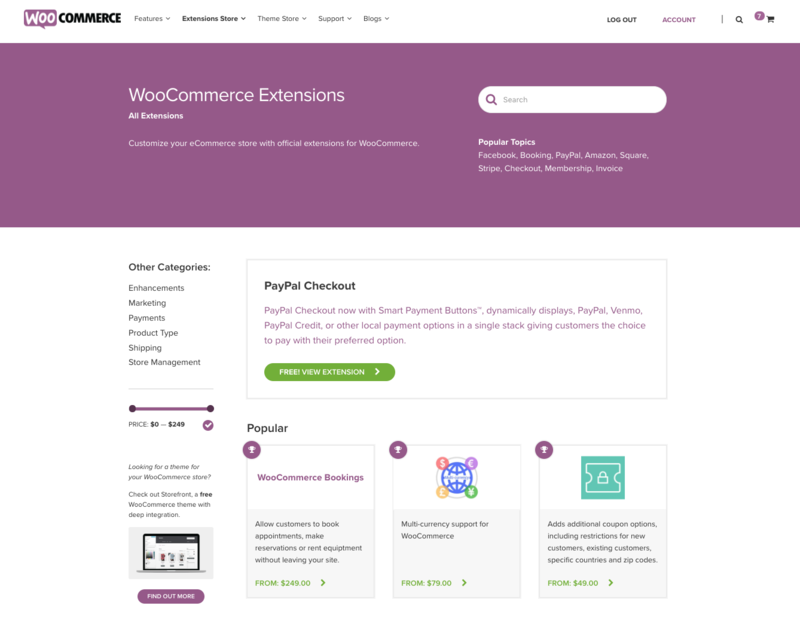 Extensions act like plugins for WooCommerce, allowing you to add more functions for essential services like checkout functions, payment gateways, shipping, and more. Here’s a list of ten free extensions from WooCommerce itself. Customer communications. You will want to communicate with your customers by email after they make a purchase and to send notices about promotions and coupons. MailChimp is a great tool for this. It offers a basic free package and a “growing business” one for just $10/month or $120/year. It integrates smoothly with WooCommerce and social media accounts and tracks everything from email opens to clicks to your website. Search engine optimization (SEO) tools like Yoast and All In One SEO provide guidance that help your writers get an edge on this key factor. Yoast costs $49/year while All in One is slightly higher at $58/year. Site security is another issue. If you’re running your site on a shared host, it’s advisable to install a security extension just in case. The vast majority of hosts are very security-conscious, but there’s no harm adding an extra layer. Services to check out include Sucuri and SiteLock. Sucuri costs $25/month (but bills annually, you’ll be charged $300). SiteLock has different plans but doesn’t publish them, so you’ll have to contact them for details. They offer a free security tool to BlueHost customers, and will heavily discount upgrades to them as well. BlueHost also recommends Jetpack, which has eCommerce-specific features including basic security functions, like protection from brute force attacks, and automatic updates. Its paid services includes additional security: automated malware scanning and security fixes, as well as daily or real-time Backups. Jetpack’s Premium package for small businesses costs $100/year and includes many other website tools outside the security arena. WooCommerce officially endorses several free extensions. Most of them deal with payment processing, but others focus on shipping, dashboards/analytics, and integration with other tools. If your budget allows you to do more with your website, the next area of focus should be enhancements that boost the customer experience and drive conversions. You could try adding product page features or cart and checkout enhancements, or make changes to your merchandizing and search and navigation. Marketing and how to make your next sale are deep topics, but as start, read more about live chat and eCommerce automation. Wishlists that store items for a set amount of time, starting at $79 per year. Abandoned cart remarketing, available from Jilt; free trial available. Fast checkouts: Single-page checkout extension starts at $79 per year. It’s possible to ‘overdo it’ with WooCommerce by adding too many bells and whistles. Loading up your website with extensions might slow down your website, which is worth keeping an eye on; even the smallest of delays might cost you a sale. Ultimately, the amount you spend on your WooCommerce site depends on how you balance your budget with tools to save you time with customer satisfaction. These aren’t always easy choices to make! Wrapping it up: the nutshell on WooCommerce costs is that it really is flexible, and up to you. If you’re on a really tight budget, you can create a high-functioning WooCommerce site for as little as $662 or $55 per month. With a bit of customization, you’re probably looking at about $1,000. Or you can customize it and spend considerably more. We’d love to hear from you in the comments how you setup your store. We’re nearly at the end of this introductory series — tomorrow we cover how to setup a new WooCommerce store as the final piece. I’m a fan of woo, but this post makes me really excited to just go with shopify for $29/mo. This post reminds me that the most useful customizations of woo will cost me yearly $ for the extensions. Most of which are $80/year like if I want color swatches as my product variation selectors or a FedEx shipping calculator. Long term, it seems much easier to go to someone who bundles all those features in a monthly cost. Sure, but it’s monthly additions for Shopify sites that have anything non-standard that will get you. Plus if you don’t have good negotiated rates on processing you still need to cut the cake with Shopify for processing. Customization for colors, theme, site, checkout, etc- $170. I really didn’t need to spend so much for customization, either. I had paid someone to do it for $70, not realizing they would be using WPBakery, which I hate. But they’d already done the work and it looked amazing, so I didn’t feel right asking for a refund. I contacted my host, explained the panic-inducing situation, and he and a designer that works with him on his site customization items hand-coded the theme how I wanted so it could be used with Elementor. They asked only for a donation, knowing how upset I was, so I sent $100 because they truly saved my sanity and that’s the highest I could afford. Grand total to start- $383. Ongoing costs monthly- Around $6. This isn’t including your products, of course, but since I’m an author and sell signed books, I just grab 10 to stock up on whenever I have a bit of spare cash at the end of the month. For my jewelry store, I’ve ran it since I was 15, and have stockpiled beads and things all these years. I’m 34 now. So I have a massive storage collection of findings, beads, chains, etc that didn’t incur any extra costs during this. All of my sites so far fit on the same $5 server, which saves money. Once they get bigger storage-wise, the next server size is $19 a month, which is still cheaper than Weebly to host so many sites, and by then, the Ecommerce portions of the site should be able to basically pay for themselves, so I will end up with a net profit instead of a loss. If you seriously can’t spend that much on an entire eCommerce store, you should not run a store at all. Gotta think a host who sells hosting for $5 and does custom themes for $100 won’t be in business long. Does he also sell steaks out of the back of his pickup truck? There is no better E-commerce platform than Woocommmerce. Agree, “WooCommerce costs is that it really is flexible, and up to you.” Since the article is about cost to RUN a Woocommerce/eCommerce store, I think about the fact that part of the cost is how far do you want to go. Advertising your site has a lot to do with that. Perhaps a post on the subject of ‘Cost of Advertising Your eCommerce Website for Sucess…’ This is what many of my clents don’t plan for. I’m about to start working on a client’s Ecommerce site and I need a plugin for WordPress/Woocommerce that allows wholesale clients to login and see the wholesale prices for items. The entire site is for wholesalers only, no retail buyers.